Paxum is a suitable payout method for all non-US countries. It is a well-known option that allows you to receive your money in a wallet and afterward, you can transfer it to a Paxum card or any other credit card. We reserve a $2 fee for every Paxum transfer. The minimum balance requested is $40. In order to get paid via Paxum, you will need a valid Paxum account and then add it as your payout method by making a withdrawal request from your SkyPrivate account (by going to Payments -> Withdraw ). As soon as we process your payout, we will notify you by email and the money arrives instantly in your Paxum wallet. 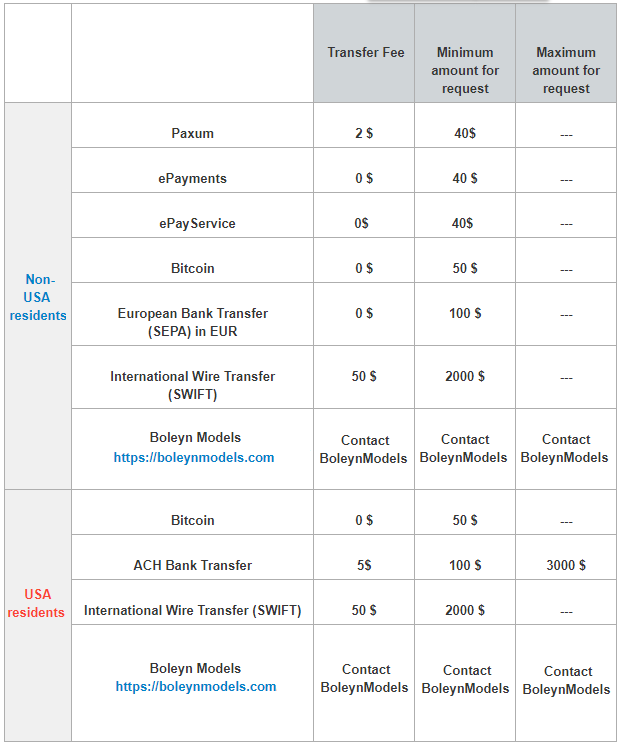 We are collaborating with ePayments for a long period of time and this payment option is a suitable withdrawal method for you if you are a non-US model/studio. Like Paxum, it allows you to receive your money in a wallet and afterward, you can transfer it to your ePayments card or any other credit card/bank account. We pay out for free to ePayments wallets, in Euros directly. The minimum balance requested is $40. In order to get paid via ePayments, you will need a valid ePayments account and then add it as your payout method by making a withdrawal request from your SkyPrivate account ( by going to Payments -> Withdraw ). As soon as we process your ePayments payout, we will notify you by email and the money arrives instantly in your ePayments wallet. This is our newest payment alternative and it's a suitable one if you are a non-US model/studio. Like ePayments, it allows you to receive your money in a wallet and afterward, you can transfer it to your ePayService card or any other credit card/bank account. We pay out for free to ePayService wallets, in Euros directly. The minimum balance requested is $40. In order to get paid via ePayService, you will need a valid ePayService account and then add it as your payout method by making a withdrawal request from your SkyPrivate account ( by going to Payments -> Withdraw ). As soon as we process your ePayService payout, we will notify you by email and the money arrives instantly in your ePayService wallet. The minimum balance requested for a Bitcoin payout is $50 and the network fee is supported by SkyPrivate. As soon as we process your Bitcoin payout, we will notify you by email and the money arrives instantly in your Bitcoin wallet. Note: The Bitcoin conversion rate is the daily rate Bitcoin - USD. We do not assume the fluctuations of the Bitcoin between the payout request moment and the day when we will process the withdrawal. For the models and studios located in countries which belong to the Single Euro Payments Area (SEPA), we can wire your earnings to your account in EUR currency. Therefore, you have to own an EUR account opened at a European bank from the European Union. The minimum balance for a SEPA payment is $100 and the fee per each transaction is $0. As soon as we issue your SEPA payout, we will notify you by email. It usually takes 2 business days for SEPA transfers to reach your account. As we work with bank systems, the period of time between the request date and the payment date is 14 days. We are aware that this aspect is very important, thus we continue to make efforts for an earlier payout. - Payment where both the principal’s account and that of the beneficiary are in one of the 28 EU Member States (Austria, Belgium, Bulgaria, Croatia, Cyprus, Czech Republic, Denmark, Estonia, Finland, France, Germany, Greece, Hungary, Ireland, Italy, Latvia, Lithuania, Luxembourg, Malta, the Netherlands, Poland, Portugal, Romania, Slovakia, Slovenia, Spain, Sweden, United Kingdom) or in Norway, Iceland, Switzerland or Liechtenstein. - The transfer amount must be denominated in euros. If you are a USA resident we have a viable payment option for you. We're able to wire your earnings for free directly to your bank account. The minimum requested amount for ACH transfer is $100 and the maximum amount that you can request per transaction is $3000. The fee per transaction is $5. As soon as we issue your ACH payout, we will notify you by email. It usually takes 3 business days for ACH transfers to reach your account after we have processed the withdraw. To use ACH as a payment method, you need to make a withdrawal request from your SkyPrivate account, by going to Payments -> Withdraw. As we work with bank systems, the period of time between the request date and the payment date is 14 days, as any other withdraw request. We are aware that this aspect is very important, thus we continue to make efforts for an earlier payout. Note: We cannot accept P.O box addresses when you fill out your banking information. We need the address you have given your bank. If other payment options don’t suit your needs, maybe you can try International Wire transfers. We're able to send money to most countries of the world. The minimum balance for an International Wire Transfer is $2000. The fee per transaction is $50. If you don’t have a USD or EUR account, the money should arrive in your bank account in your local currency. Please ask your bank if they allow transfers from USD/EUR accounts to your local account. As soon as we process your payout, we will notify you by email. It usually takes 3 - 5 business days for international transfers to reach your account. Note: if your country is part of the European Union, but you don’t have an EUR account, then you will need to opt for International Wire Transfers, not SEPA Transfers.